The Olympic Stadium will be "one of the greatest arenas in world football", according to West Ham United vice-chairman Karren Brady. The Hammers will leave Upton Park and move in to the new stadium for the start of next season. "The Olympic Stadium offers enormous commercial and brand opportunities," added Brady. 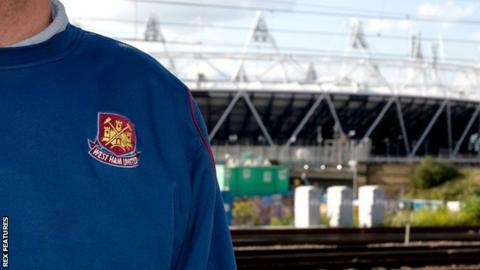 In August, BBC Sport revealed that West Ham will have many of the running costs for the stadium met by the taxpayer. In effect, it means the Premier League club will get their new £700m home - which was built for the London 2012 Olympics - virtually rent free as a large number of "facilities and services" will be paid for by the publicly-funded London Legacy Development Corporation. These include the cost of stadium utilities, maintaining the pitch, and the goalposts and corner flags, though the latter two will also be used for other sporting events. West Ham will only rent the stadium for 25 match days a year and do not own the ground or facilities. The club plan to move into the 54,000-capacity venue in August 2016. West Ham's annual report revealed a profit after tax of just under £3m for the 2014-15 season, while turnover was £120.7m, up from £114.8m. The wage bill rose by £8.8m to £72.7m. In comparison, Manchester United showed a turnover of £395.2m in their last report - the highest in the Premier League - followed by Manchester City with £351.8m. West Ham are currently sixth in the Premier League. "Retention of our Premier League status in the 2015-16 season is an absolute necessity for the future well-being of the club," added Brady. "The Olympic Stadium offers enormous commercial and brand opportunities and we have a strategy in place to deliver sell-out crowds and enter the stadium with a team that are befitting of such an amazing, iconic venue. "As plans take shape it becomes even more apparent that our new home will be one of the greatest arenas in world football and a platform to transform the future of our great club."